Avudaiyarkoil is situated approximately 40 km from Pudukottai in Tamil Nadu. The area is believed to date to the pre-historic period, but in its present form it mostly dates to the 17th century. The Athmanathaswami temple in Avudaiyarkoil is dedicated to the worship of Shiva as Atmanatha and has many life-size sculptures and elaborate wood carvings. The temple consists of an inner court with a mandapa (columned hall) that has elaborately carved pillars. The pyramidal tower over the entrance to the sanctuary, the carved pillars and the roof of the porch are all made of granite. 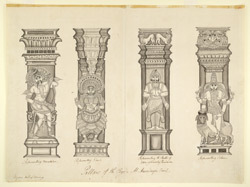 This drawing depicts some of the elaborate pillars with shafts that are carved with sculptures executed almost in the round.